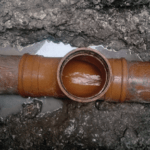 The time taken by UKDN Waterflow (LG) drainage engineers to explain why a pipe repair was needed was just as impressive as the repair itself, says insurance customer Teresa Frith. She and her husband, James, had to make a claim on their home insurance after a waste pipe leading from their home became blocked. UKDN Waterflow (LG) was allocated the job of investigating the cause of the problem, so the blockage at the house in Hampshire could be removed. Mrs Frith said: “We were delighted with the response of UKDN Waterflow (LG). The two drainage engineers who came out to us explained what the problem was and showed us the picture of the broken pipe on their camera. The Friths became aware of a problem when they began to have difficulties with flushing an upstairs toilet. They called a plumber who concluded that the waste pipe was blocked outside the house. This resulted in The Friths being advised that they would have to make a claim on their insurance to resolve the matter. A UKDN Waterflow (LG) CCTV drainage survey team found that a section of the drain under the Friths’ drive had cracked. This led to a build-up of debris which had blocked the pipe. The UKDN Waterflow repair team used powerful jets of water to clear the blockage, then mended it by inserting a sleeve of glass fibre cloth impregnated with resin inside the cracked section. The technique, known as patch lining, gives the pipe a new inner wall that remains tough and waterproof for decades. It can be carried out quickly, without the need for messy, costly and disruptive excavations.